The Nintendo 3DS unveil event happened this morning in NYC and it was an exciting one! 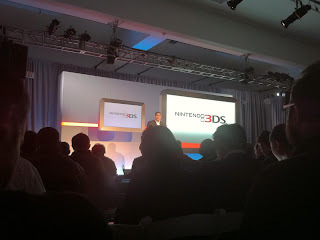 The unveil was lead by President of Nintedo Reggie Fils-Aime. The device will hit retail March 27th at a price point of $249.99 in cosmo black and aqua blue. *The 3DS has the look and feel as the others in the DS lineup. There are a few added buttons like a home button and an analog button for added movement and the screen is 10% larger. *Built in pedometer encouraging and tracking movement. Enough steps can earn you coins for bonus content. *At launch there will be a bunch of games including but not limited to; Zelda (fingers crossed for gold cartridge, Nintendogs and Cats, Steeldiver and Pilotwings Resort (similar in fashion to Wii Sports Resort). 30 titles will be available by June. Let's just hope all those reports of getting sick and or not recommendations of not using for more than a half hour for kids under six stay at bay. Can’t really argue with their pitch of it being in a category of its own. Welcome back into the gaming world Nintendo! Hmmm... I pre-ordered two of them without indicating the color. I hope I get one of each! I love you Katie lol.Nice work mommy,the 3DS is definitely going to sell big this year.